Save 24% off the MSRP on Ergomat’s DuraStripe 4" x 50' Glow Peel & Stick Floor/Aisle Marking Tape (Q Source SKUs: T023-000509 (Yellow), T023-000507 (Red), T023-000508 (White)) when you use our FPF082214 Coupon Code. This Featured Product Friday (FPF) promo is valid from today, August 22, 2014 through Sunday, August 24, 2014. These DuraStripe Glow Floor/Aisle Marking Tapes (MFG Part Number: DSIL450-G.25) have a 0.25”-wide glow stripe, are available in red, yellow, or white; and are made of glow-in-the-dark materials. 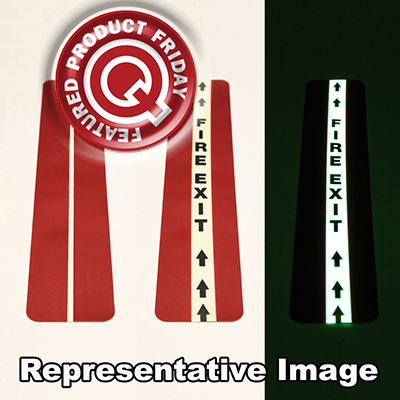 Quick and easy to install, these tapes are great for indicating evacuation/exit routes, and require no dry time, cure time, fumes, or messy clean up. Regularly listed at $75.00, but with our FPF code savings you’ll get it for just $57.00. While this is a 3-day limited-time price, the coupon is unlimited. Use the code as many times as you like while it is valid—and please feel free to share the code with your friends, colleagues, and via social media.